Bali Hotel This white villa gives you unreal holiday in Bali. 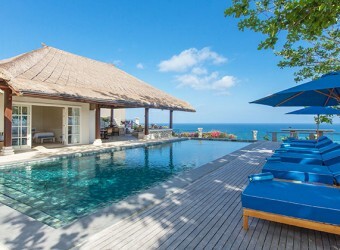 You can see wide panorama view of endless blue Indo ocean from villa. There is private sundeck, bar counter, open air dining area is perfect spot for hanging outwith your family and friends. The villa has 3 types such as Karang Dua, Karang Nusa and Karang Putih.